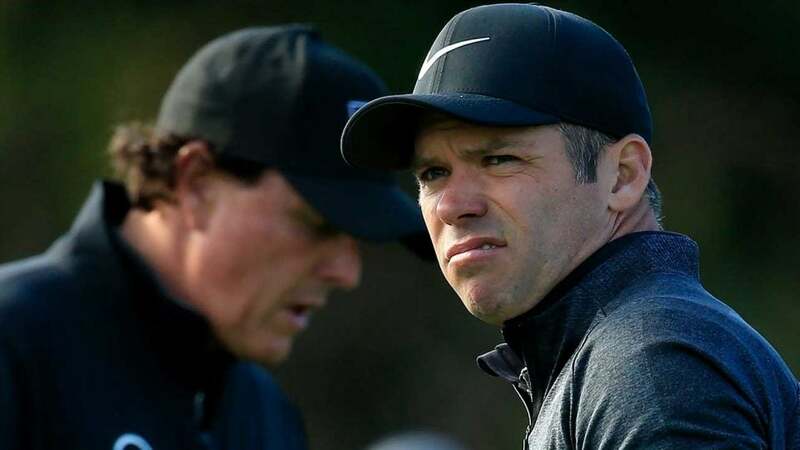 Paul Casey and Phil Mickelson will square off on Monday at Pebble. The AT&T Pebble Beach Pro-Am will finish on Monday morning at Pebble Beach Golf Links, as Phil Mickelson will try to close out PGA Tour victory No. 44. Mickelson, who trailed by three to start the day, passed Paul Casey on the back nine and continued his ascent. He sits at 18 under, three ahead of Casey and Scott Stallings. Stallings completed his round, and Casey has a 3-footer remaining on the 16th green for par. Mickelson finished the 16th hole. They’ll resume at 8 a.m. local time (11 a.m. ET). For those in the area, admission is free and no tickets are required. To watch online or on TV, Golf Channel will carry the coverage, and CBSSports.com and PGATour.com will stream the action. If Mickelson wins, it will be his fifth victory in the event, which would tie him with Mark O’Meara for the most in history.